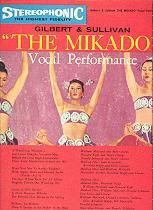 Shortly after he left D'Oyly Carte, Martyn Green made another recording of The Mikado, his third, on a rival label. Copyright laws of the time permitted such recordings, even though D'Oyly Carte still controlled the stage performing rights. The circumstances of the recording are fuzzy, but it appears that the three "stars" (Green, James Pease, and Karl Brock) recorded their parts in either England or America, while the orchestra, chorus, and remaining principals recorded their parts in Germany. There's no question that most of the singers are German, and odd differences in the recording levels suggest that not all parts were recorded at the same time. A few years later [after it was made], I found myself working for Eli Oberstein, the impresario of Royale and the creator of this particular album. It seems that Eli recorded the vocalists (in New York, I think), with a piano playing the accompaniment very softly in the background. Then that tape was flown to Hamburg, where producer Paul Lazare fed it through earphones to the conductor (Richard Korn), who was responsible for keeping the orchestra tempo in sync with the already-recorded singers. Lazare had formed a house orchestra (the Hamburg Philharmonia on some occasions) consisting mainly of musicians from the Hamburg Opera and the radio and symphony orchestras. 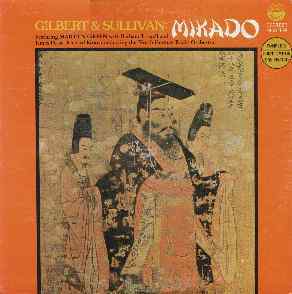 Their work consisted mainly of standard classics, which were sold to such labels as MGM, Royale and RCA Camden, but Lazare would also record specific works for a regular client (such as the music of American composers recorded for MGM) and specialty items like Oberstein's Mikado. Oberstein was using the same technique to record albums of operatic arias by the likes of Giovanni Martinelli, Lawrence Tibbett and James McCracken. In the latter case, something went wrong and the orchestra was a full half-tone higher than the singer. The technique of multitracking was still a good ten years away when Oberstein and Lazare came up with this arrangement. 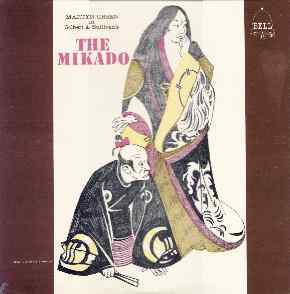 Multitracking generally involves laying down the instrumental tracks first and putting the vocals on top of them, the exact opposite of what was done in The Mikado. 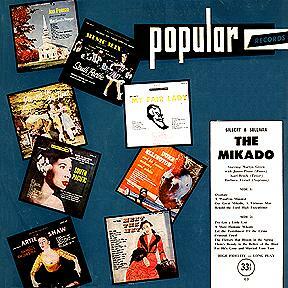 This is a Mikado that Martyn Green recorded shortly after he left D'Oyly Carte in 1951. The liner notes have a 1954 copyright but refer to Green's memoirs (1952) and the G&S movie (1953) as still in progress. My copy is Allegro-Royale 1574-1575 (two LPs); a 1960 Schwann catalogue lists the same recording as Rondolette 22. This set is awful: worse than the Phase-4 Pinafore, worse (if you can imagine it) than Green's 1966 Pirates on RCA. The album cover sets the tone, with photos of Green and conductor Richard Korn looking like restaurant captains confronting a tramp. Korn directs "The Philharmonic Orchestra" (who had the good sense not to give their right names) and the North West German Radio (NWDR) Chorus. James Pease is by far the best of the soloists: so good, in fact, that he was asked to double the Mikado and Pooh-Bah. He alone combines a good singing voice with a sense of characterization and even appears to be enjoying himself. It also helps that he's English; apart from Green and American tenor Karl Brock, all the others display Germanic accents ranging from strong to impenetrable. Green gives the worst Ko-Ko performance of his recording career, exuding a "let's get this over with" attitude. Brock sings through his nose and much too close to the microphone; [His American accent is also extremely irritating. —ed.] James Stockmann (Pish-Tush) sings through clenched teeth. Barbara Troxell (Yum-Yum) wobbles on the high notes, and Ursula Boese (Katisha) has a passable voice but no grasp of the required changes of mood. Peep-Bo and Pitti-Sing are, mercifully, uncredited. But the real villians of the piece are the arranger and the sound engineer. The orchestration is atrocious and appears to have been made from a vocal score. [Doubtless, D'Oyly Carte would have been unwilling to rent or loan scores to a company seeking to make a competing recording. —ed.] Countless passages are played by the wrong group of instruments or in the wrong octave; traditional humorous effects are absent, and added effects abound; staccatos and dynamics are disregarded; extraneous piccolos, brass and drums are everywhere. 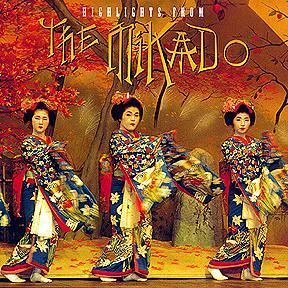 The miracle is that The Mikado is such a masterpiece that some of its spirit shines through the dreary presentation. Some, but not enough. I've never been able to take it all in one sitting. "Taken from the county jail"
Smith also adds that the Pitti-Sing (not credited on the album sleeve) sounds like the same singer as Katisha. His final comment: "I doubt that I will ever want to listen to any version [of this recording] again." 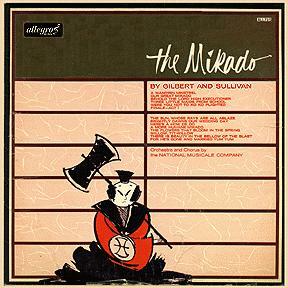 The late 1950s highlights disc on Rondolette, reissued in 1961 on Bell, includes the overture, "A wandering minstrel," "Our great Mikado," "Virtuous man" [sic; listed as a separate item, but in fact a typo], "Behold the Lord High Executioner," "I've got a little list," "A more humane Mikado," "Let the punishment fit the crime" [sic], "The crimial cried," "Flowers that bloom in the spring," "Willow, titwillow," "There's beauty in the bellow of the blast," and "For he's gone and married Yum-Yum." Your page does not give a description of the cover, which is one of the least appropriate (also ugliest) covers ever produced. It is a color photograph of three "oriental" dancing girls in reddish-purple two piece costumes with bare midriffs, their arms up in the air. (Three little maids?) Kneeling before them, their hands clasped above their heads in a gesture of supplication, are two young men, naked from the waist up, wearing red turbans and arm bands. On the back is a photo of Green looking like a lounge lizard with a tiny black mustache. There are liner notes mostly of Green with a word or two about the principal singers. Nothing is mentioned of the chorus or orchestra or where or when it was recorded — only "A product of the Rondo Record Corporation, Union City, NJ. Mike found it in a thrift score for fifty cents, and he opined that it is "undoubtedly the worst recording of anything ever made." I replied that Mike had paid $0.49½ too much. 1954 Royale 10" Mono LP 1882 Highlights. Performers given only as "The Savoyards". 1956 Allegro Mono LP 1681 According to Bob Lang, the cover pictures "a b/w portrait of Green holding the ugliest red fan I've ever seen." Late 1950s Rondolette Mono LP A22 Highlights. Also issued as Rondo ST586, date unknown.